Are you familiar with the white wine grape, Albariño? It’s most famous in Spain, and you’ll see it in Portgual referred to as Alvarinho. But in Oregon? In Washington? Yes and yes, you’ll find Albariño in both states. It’s wild to think that Abacela has been making it–from their own fruit, no less–since 2001. A seafood-loving, heat-busting wine, this Albariño is also notable for where it’s grown: not in the well-known Willamette Valley, but rather in Southern Oregon’s Umpqua Valley. It seemed serendipitous that right after I had finished enjoying this sample bottle sent my way, I was off to Wenatchee, WA for the first time. And there I would expand upon my repertoire of Pacific Northwest Albariño. Thanks to Visit Wenatchee, I was off for a weekend sojourn to the epicenter of apples. Spoiler alert: there would also be cherries. And (fermented) grapes. First things first. It was going to be scorching hot. Yowza! I was staying at the Warm Springs Inn and Winery, where the warmth comes from both Wenatchee in July and the owners, Julie and Ludger Szmania. Also, the Inn is located on “Love Lane“, so maybe that contributes to the overall vibe. Ohme, oh my! Thankful for the shade. 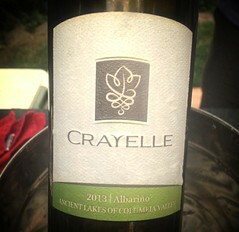 It was here that I discovered an Albariño from Washington State: the 2013 Crayelle Cellars. It was definitely my wine of the night. Like the example from Abacela, it’s lively and refreshing. And the fact that I field-tested this in extreme heat should lend extra credence to my assessment. I returned back to the Warm Springs Inn for some triumphant beer and peeping of the super moon. 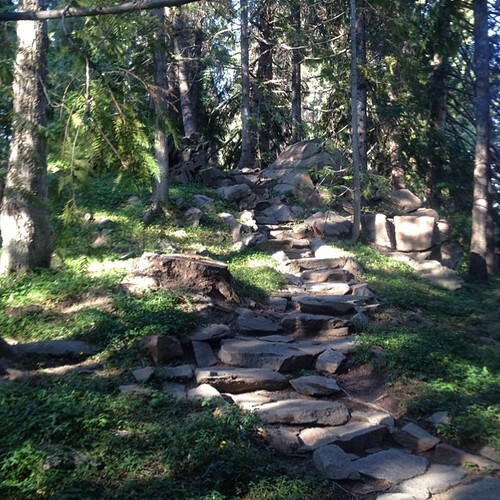 Sunday brought a bike ride around the river along the Apple Capital Loop Trail (before it got murderously hot). Afterwards? 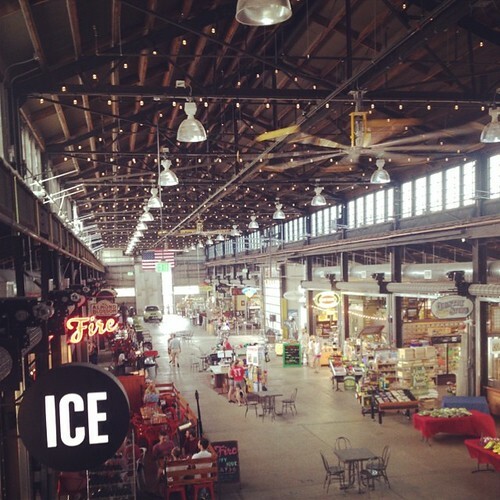 Lunch at the super-cool Pybus Market. At a spot called Fire, we enjoyed a multitude of wood-fired pizzas. The most notable being one with local cherries, bacon, and goat cheese. Then a gelato sample at Ice, an olive oil and vinegar tasting at D’Olivo, a quick wine tasting at Jones of Washington (I got the Sauv Blanc), and a coffee at Cafe Columbia to finish. If you’re wondering how I drank hot coffee in that heat, the market is mercifully air-conditioned. As Albarino is one of my favorite grapes, I was glad to see it mentioned and that you came to the good side of the state. Crayelle is doing a good job for their second vintage. Warm Springs Inn is one cool place. Did Ludger and Julie tell you that they also have their own label, grown in the Cashmere region? I got to try a red wine from their vineyards; the story of them planting vineyards in Cashmere is a good one. 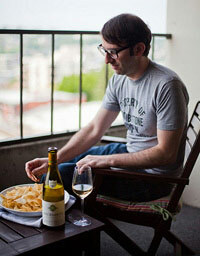 Look forward to more people working with Albariño in the Pacific Northwest. I think it’s cool we’re having a conversation about Washington Albariño! We should plan an event with a bottle of each. Hope you are well and thank you for the commment. Thanks for the great article about our region. Glad you discovered one of Cascade Valley Wine Country’s many hidden gems in Crayelle’s Albarino as well as experience the Food and Wine Gala at Ohme Gardens in Wenatchee. Thank you, it was a really nice trip. 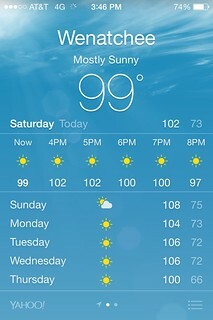 I’m glad you enjoyed your trip to our area and survived the heat. Thank you for the nice comments on our Albarino. Cheers! The well-chilled Albariño was a big help. Cheers. I have enjoyed a Washington grown Albariño from Idilico. 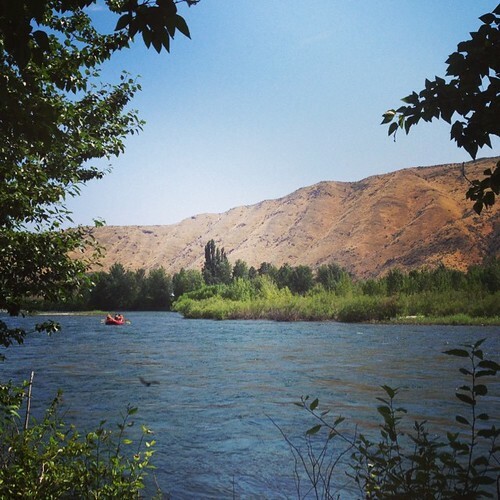 Grapes come from the Wahluke Slope – not so far from Wenatchee. That’s the second vote for Idilico. (See Sherry’s comment.) Clearly I need to buy a bottle! Thanks for the comment. Coyote Canyon Albarino is also outstanding. They run out quickly. Made from their own grapes. Thanks for your comment. I know have two more I need to try. Might have to put together a tasting, maybe throw a Spanish bottle in their, too? 3rd vote for Idilico’s Albariño. Admittedly the only domestic version I’ve had, it was surprisingly good. Refreshing levels of acidity and flavor. I just poured it at a dinner last night. Was really impressed and the price was right: under $15. Thank you for the tip. Love hearing about more Albariño from Washington!